Across our Portland area houses are aglow with Christmas lights and if you have yet to break out the ladder at your house, maybe this is the year to hire someone to do the job. There certainly are a lot of companies that will do the work, but. It’s not an easy job, so you want to be sure the person hanging your lights knows what they are doing and can prove they are insured. The lights are out all over Portland, but in a good way. This is the time of year to decorate your yard and home for the holidays. While you can do it yourself, there are businesses popping up overnight that will do the job for you. However, there’s one thing to keep in mind. A professionally done job does not necessarily have to be expensive can be affordable. 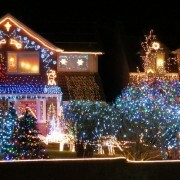 The costs depend on how many lights you want. Before you hire a company to do the job, we recommend making sure the company can take care of employees and make repairs if there is a problem.